There is no shortage of bat costumes for kids on the market today. Whether your little one wants to be a scary bat or a sweet one, you will have no problem getting the necessary gear to dress her up this Halloween. 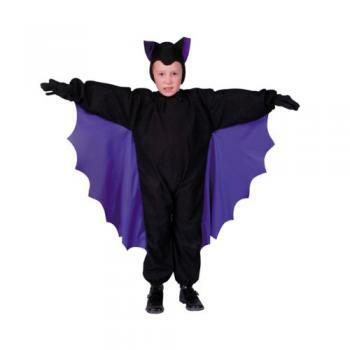 Boys: Halloween Costumes features a life-like plush bat costume for boys. It includes a black headpiece with an attached jumpsuit, which can be embellished with fake blood and spider webs. Girls: If your little princess wants to dress up as a bat this Halloween but hasn't completely embraced the dark side, then the Sweetheart Bat costume from CostumeSupercenter.com is a perfect choice. It includes a black and purple polyester dress with a tutu and a glittery headpiece and matching bat wings. Pair them with knee-high black boots and gloves and your bat-ress will be the hit of the neighborhood. Toddlers: Oriental Trading offers a darling bat costume for toddlers. The three-dimensional fleece costume is stuffed with polyester padding and has a cotton lining for warmth and comfort. The costume also has a separate lined headpiece that doesn't obscure a child's vision. Infants: Even the littlest ones can go batty on Halloween. WholesaleHalloween.com features an adorable Baby Bat Halloween Costume for newborns and infants. The cozy zippered bunting is made of furry plush and is lined with satin to ensure baby's comfort. The costume's big, purple wings are attached to the bunting with hook 'n loop fasteners. 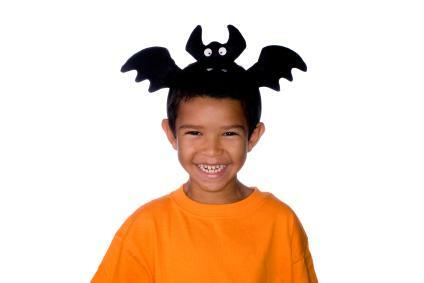 The bat costume also comes with a generously cut headpiece with satin-lined ears. To make the wings for the bat costume, carefully cut the umbrella material away from the frame. Use black duct tape to patch any holes in the umbrella material. Draw lines with glow-in-the-dark puffy paint along the seams of the umbrella material. When the paint is dry, fold the umbrella material in half along a seam and safety-pin the straight, folded edge to the back of the sweatshirt. Tape black ponytail holders to the inside of the bat's wing tips. Your child will slip his wrists in them when it's time to wear the costume. Cut out bat ear shapes from the black felt. Bend the pipe cleaners' ends in opposite directions and affix them to the lower tabs of the felt ears with double-sided tape. Outline the bat ears with glow-in-the-dark puffy paint. Attach the felt bat ears to the sweatshirt hood with the double-sided tape. You can use the aforementioned sample as the base for a more elaborate bat costume for children. For a fancier version, consider adding a bat mask or outlining the wings with glitter. You could also substitute purple sweats for black ones, and then try to find a purple umbrella if you want to give your kid's bat costume added drama.